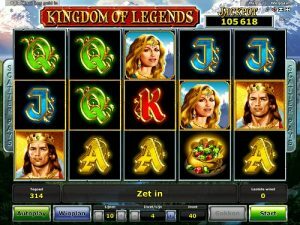 Brought to you by NovomaticCasino.co.uk, Kingdom of Legends is a legendary slot game, full of treasure and royalty and jackpots abound! Fans of other NovomaticCasino.co.uk slots like Garden of Riches, Jackpot Diamonds and Fruits ‘n Royals are sure to love this unique slot. Whether you’re a pro slots player, a newbie or simply a fan of history or myth, this slot is a must-play. Channelling the legend of King Arthur in more ways than one, this slot will have you dreaming of a time when Kings and Queens and treasure were fairy tale-like and royalty still lived in picturesque castles. Play it for yourself, under the background of snow-covered mountains and idyllic waterfalls, and watch as the jackpot grows with each spin! Every Single Symbol is a Scatter Symbol! Each of the unique symbols in Kingdom of Legends: the card values, the jewels, the treasure chest, the Queen, the King and the crown, are all Scatter symbols and therefore you’ll be winning until kingdom come! Most of the symbols pay out if you spin 5 or more, except the King which pays out from 4 and the crown which pays if you spin two. You can check the paytable to see how much each symbol is worth according to how many you spin and how much your bet is, which itself is displayed at the bottom of the screen in the middle. You can increase or decrease your bet whenever you want, just by using the plus and minus symbols to either side. The best thing about this legendary game is its legendary jackpots. Each symbol, except the crown symbol, has its very own jackpot! The values of the jackpots correspond to the amount each symbol pays out, so the card values have the smallest jackpots and the King has the biggest jackpot – which will be the amount you can see at the top right-hand side of your screen. The jackpots are progressive jackpots, which mean they grow bigger the more you play! Talk about player rewards! You can play Kingdom of Legends for free until you’re ready to play for real. When you’re an expert in the game, you can set the reels to ‘autoplay’ and let them spin for you. You can also gamble your wins in Kingdom of Legends, which means that you can turn even the smallest of payouts into a massive sum! At every step of the gamble pyramid, you’ll need to click whilst the step is lit up! Do so and you’ll double your win, otherwise you’ll be back to the reels empty-handed. Kingdom of Legends also gives out 10 free spins whenever you spin three or more of the crown symbols, anywhere on the reels! Before you start the free spins, the game selects a symbol at random to be the bonus symbol. This symbol, whenever it falls on the reels, will stay there for the rest of the free spins – giving you almost always guaranteed wins and a decent shot at getting the jackpot! Here at NovomaticCasino.co.uk, aside from our extensive selection of slots and video slots, we also have some entertaining and lucrative table games and live dealer games. Our table games are perfect for high-rollers and include the likes of: Multiball Roulette, Royal Crown 3 Card Brag and Sic Bo. Our live dealer games are brought to you using the latest technology and will have you feeling as though you’re playing right in the middle of a real casino. You can choose from: Live Baccarat, Live Blackjack, Live Poker and Live Roulette. Once you’ve tried one, you’ll want to play each and every one of our selection!